Just got back from the looongest shift at work ever. Why is it that some days go really fast and others just go on and on and on? Only three shifts left though, cant wait to never serve shoes to the public again! I absolutely rinsed my uniform discount today before I leave next week and got some lovely boots that I've had my eye on for ages, a sparkly skirt to wear for Christmas, and a snuggly burgundy jumper. 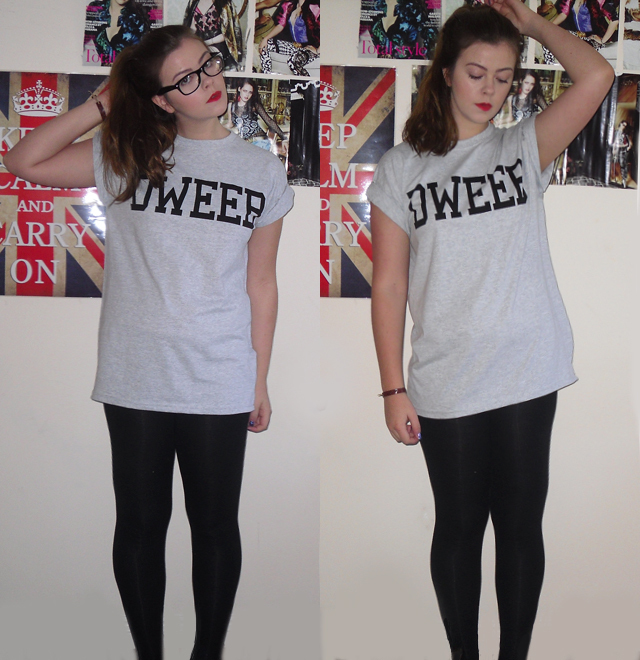 In love this tshirt that I picked up a few days ago. The fit is perfect and it's so rare for me to find a tee that's long enough to cover my bum so I can just wear it with leggings because I'm quite tall. 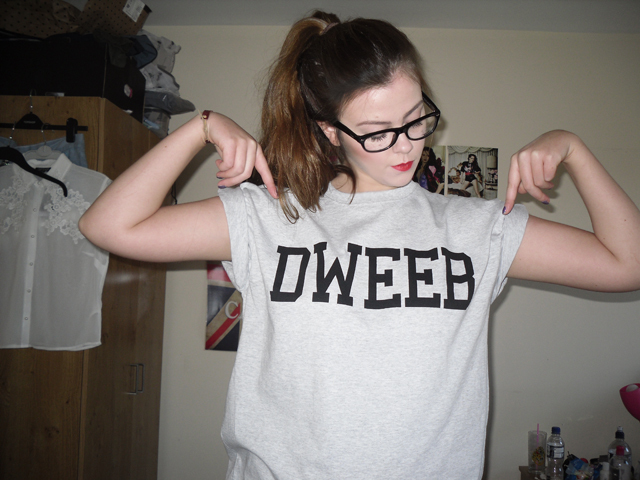 I really liked the dark green 'geek' version too but Sean always calls me a dweeb so I thought it was quite fitting. Paired it with an old school 90s high pony tail for no other reason than my hair was doing my swede in this morning. Cameo from Flo who thought she'd try out some poses this morning. Stupid puss. 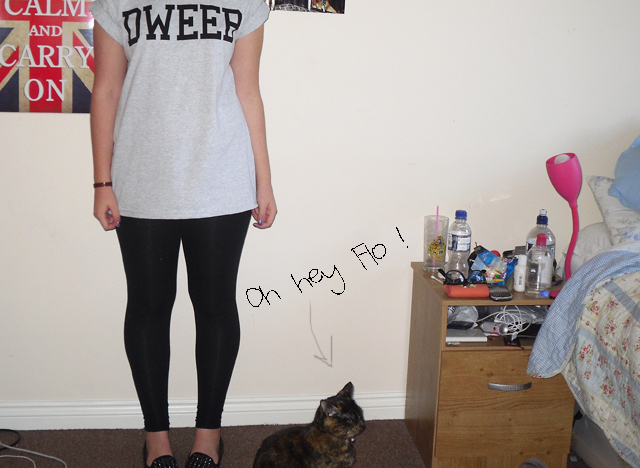 I love this outfit, the top looks really comfy :) Bless Flo she's really cute! I have the same problem with tshirts always being too short for leggings, it suckzzz, but I love this tshirt and the fact it does actually cover your bum makes me want it even more! 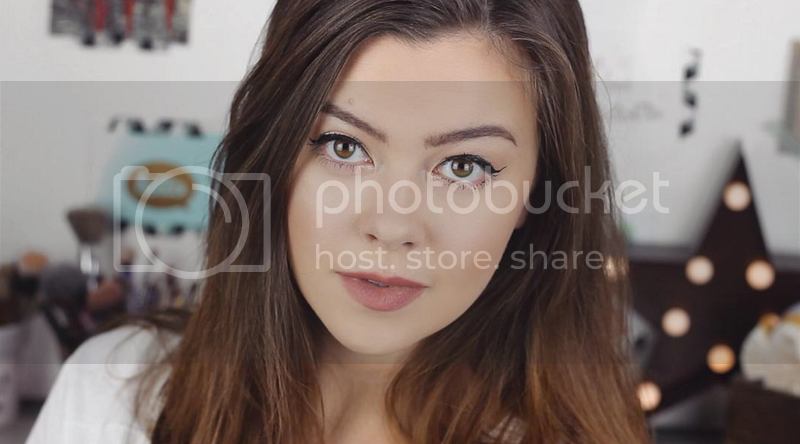 Lucy, so so lovely to see you back blogging again.. i've missed your pretty face and beautiful hair!